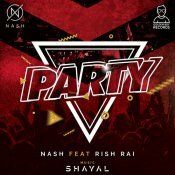 After the huge success of his last two hit singles “Drop It Down” & “Tere Nakhre“, Golden Boy Records are proud to present BBC Asian Network Future Sounds artist Nash’s brand new smash hit single entitled “Party” featuring Rish Rai, music by Shayal! ARE YOU Rish Rai? Contact us to get a featured artist profile page.